I have been on a southwest kick in the kitchen lately, beans and hot peppers have been a staple. I enjoy making a large salad at the beginning of the week so that I can eat on it throughout the week and this is my third week throwing together a southwest salad. I have been using cilantro lime vinaigrette dressing but was craving a creamier dressing to ease the heat of the hot peppers. I tweaked my vinaigrette dressing and added a bit of greek yogurt and created a delicious creamy cilantro lime dressing that compliments a spicy southwest salad wonderfully! 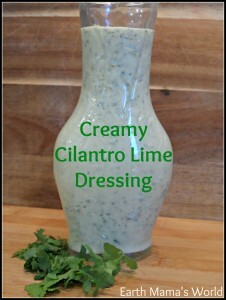 This creamy cilantro lime dressing would compliment almost any southwest or tex-mex inspired dish. The greek yogurt helps to cool your mouth in between spicy bites. My daughter loves using this dressing as a dip for carrots, cucumbers and red peppers. You can easily double or triple this recipe to meet your needs and it stores in the refrigerator for at least a week. 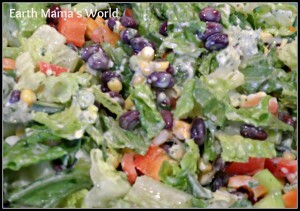 This southwest salad with creamy cilantro lime dressing is a perfect dish for a pot-luck event. I make it at the beginning of the week and eat it for lunches and side dishes throughout the week. 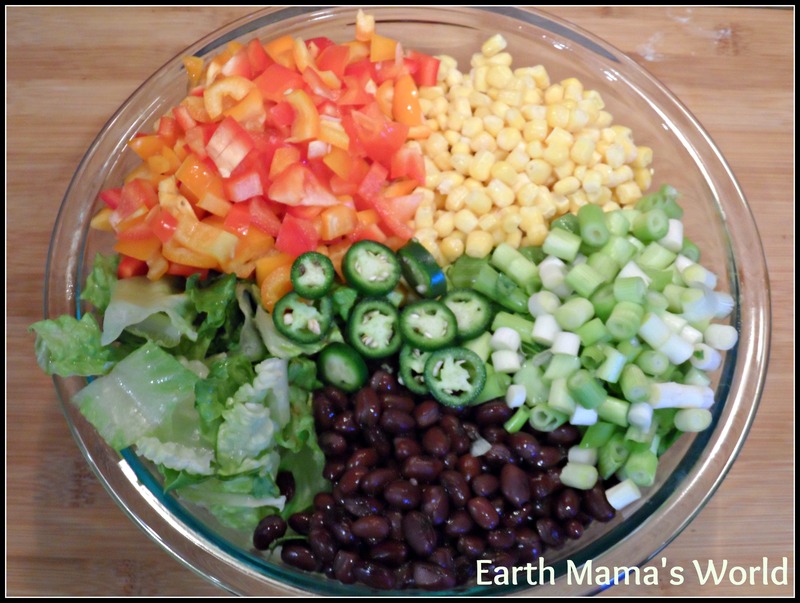 My kids enjoy this salad as well, it is a healthy dish for our entire family! If you want to add heat to your dressing add a bit of cayenne pepper or jalapeno. To make a vegan dressing replace the greek yogurt with non-dairy yogurt or an avocado. Puree all ingredients in a blender or food processor until smooth. Chill for an hour or two and enjoy! Chop all of the ingredients and toss in a bowl. Drizzle with Creamy Cilantro Lime Dressing and enjoy! To see all of my recipes please click here. This is a delicious southwest salad topped with a creamy cilantro lime dressing. For dressing: puree all ingredients in a blender of food processor until smooth. Chill for an hour or two and enjoy! 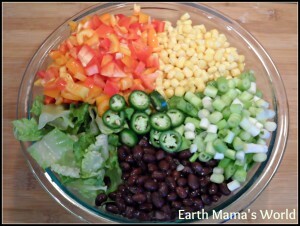 For salad: Chop all of the ingredients and toss in a bowl. Drizzle with Creamy Cilantro Lime Dressing and enjoy!